This must see, very beautiful, very spacious 3 bedroom apartment is in a beautiful complex that has well maintained clean swimming pools, children's play park,car park facility, gym, sauna, 24 hour CCTV Security, all within walled gates & landscaped gardens. 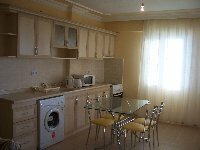 The apartment is fully & tastefully furnished with 2 balconies, Air Con, Satellite TV with English Channels, CD�s, DVDs, books, toys, board games, washing machine, fridge freezer etc. It has a fully fitted functioning kitchen. 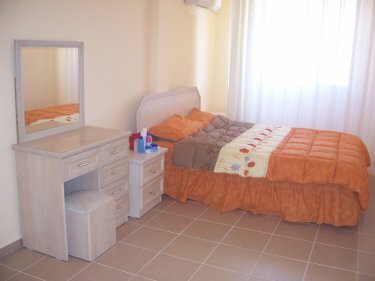 The apartment & complex are very nice & ideal for families, couples, groups of friends etc. The atmosphere is very relaxed & friendly. 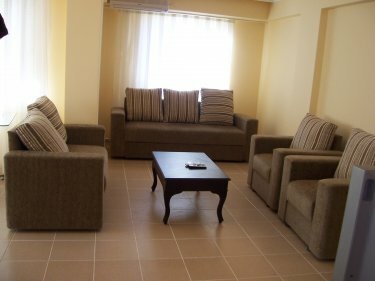 The Apartment and Complex have most things you need to enjoy a well deserved holiday. Ideal for all. You will love it. Why don't you give it a try. Our reviews speak for themselves. The location is good. 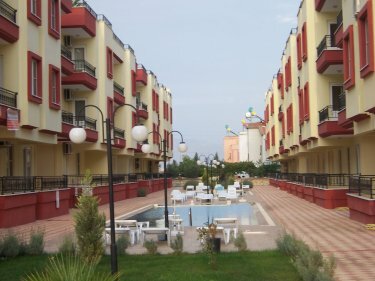 It's quiet enough to get away from it all but also close to Didim Hospital, Bus Garage, great tourist attractions & activities. 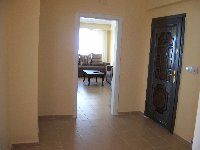 The complex is 10mins by mini bus (Dolmus) to 3 beaches & numerous bars, restaurants and activities around the beach area. 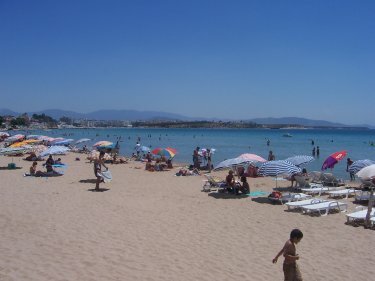 It is also 10mins walk (or 5 mins by mini bus) to the city centre where there are 3 big supermarkets, Burger King, Macdonalds, numerous bars & restaurants etc; 5 mins walk to the bus garage, supermarket (part ot tesco), Didim hospital, Saturday market with lots of bargains (worth a visit) and 1 min walk to the mini market & bakery. You can get the dolmus bus outside the complex gate. The above rates are in Pounds Sterling. The above weekly rates are for 6 people. For 4 people or less, we might be able to offer further discount especially for 2 people only. Further discounts off the weekly rate will apply for 4 weeks bookings & for repeat bookings. The above competitive discounted weekly rates include electricity & gas. The monthly rates do not include electricity & gas. Higher rates will apply if more than 6 people. The apartment sleeps up to 7 people. For more than 6 people, there is an additional charge of �20 per person per week. You can book any number of nights you want subject to availability. It does not have to be full one or two weeks. It can be 10 days etc. For more than 7 nights, the daily rate will be the weekly rate divide by 7, multiplied by the number of nights you want. For bookings less than 1 week, the cost will be the same as the weekly cost. Payment is accepted in British Pounds Sterling or Turkish Lira. Please contact us for availability & booking form if you are interested. A deposit of 25% is required to secure the booking. Full rental payment is required 10 weeks before arrival. This deposit & full payment will be refunded if cancelled 10 weeks before arrival and non-refundable if cancelled less than 10 weeks before arrival. For short term bookings, brokerage fee of �150 is also required 10 weeks before arrival. This will be refunded if booking is cancelled. Brokerage fee is to cover breakages, damages etc. It will be refunded 2 weeks after departure subject to satisfactory inspection checks. If any damages, breakages etc, this will be deducted from the refundable deposit. For monthly bookings, the brokerage fee will be �200. All brokerage fees will be refunded after 2 weeks of departure, subject to satisfactory inspection checks. Please feel free to contact us by e-mail or phone if you are unsure of rates, availability or anything. We will be happy to deal with all enquiries.